Looks like another big year on Everest, but not a record. Teams continue to arrive at the base camps but are also beginning to climb. Progress is swift on the Nepal side and about to take off on the Tibetan side. Nepal – Into the Icefall! EBC is buzzing with activity. Guides are running their members through skills review. There is a training course set up just aside of camp that many teams will share. It usually includes some steep snow slopes, a couple of ladders (horizontal and vertical) and a rappel station. As I mentioned in an earlier post, this training is not designed to replace experience but rather to give the guides a feeling of everyone’s skills and to give the members a feel for doing these tasks at 17,500′. The guides and a small Sherpa team went over to fix a ropes course in the glacier in front of our camp. That area is perfectly flat, like frozen lakes in between pinnacles of steep ice. We made a steep ladder transitioning to two steep ropes upon which members had to climb with a mechanical ascender in one hand and using their crampons points, both their ten points and their two front points. After that there was a rappel / abseil down to two ladders across a pretend crevasse then lots of arm-wrapping traversing and a final double rope steep climb – traverse – abseil! Several members practiced this several times, even with their high altitude mittens (which are big and clumpy) clipping and unclipping their carabiners and ascenders. IMG reports their Camp 2 around 21,500′ is now established with cook, dining and sleeping tents. The first wave of their climbers will leave any day now. A lot of UK people are following Kenton Cool who is guiding Ben Fogle and Olympian cyclist Victoria Pendleton for an Everest attempt. They are still trekking but will arrive at EBC soon. You can read here how they plan to “conquer” Everest. Lhotse has 88, many of these are doubles – Everest/Lhotse of which some will not make it. In 2017, 729 permits were issued for 21 different mountains, so climbing down a bit. Speaking of the “other” peaks, many of the expeditions have arrived at their respective base camps and should start climbing soon. Base Camp is in and now some teams have already established the Intermediate Camp and Advanced Base Camp. The rope fixers will be fixing the route to the North Col in a few days. Soon teams will move to ABC and use that as their base for a week to ten days making at least one rotation to the North Col before returning to CBC. I slept intermittently through the night, but with frequent stomach cramps. Thankfully, I woke feeling OK – we ate breakfast at 9am Chinese time when the sun had not yet hit camp, so we were fully layered up. Today, we hiked for a couple of hours up a hill behind base camp to a high point of 5,355m. At that altitude, there is about 50% of available oxygen compared to sea level. This morning my oxygen saturation was 87%, which indicates that my body is working hard to get oxygen to my muscles and vital organs. It does this by increasing my respiration (breathing) rate – one side effect of this is that I breathed out a lot more water vapour and have to drink much more than normal to compensate. I felt good on the hike up, and I’m looking forward to hiking a bit higher tomorrow. My stomach remains problematic and I’m taking some meds to deal with it. Kari Kobler gave me another update on that side along with a few nice photos. Himalaya Expedition led by Somduck, the local legend on northside, were the first to arrive. Their Sherpas are going to start fixing above ABC up to North Col tomorrow. 7 Summits led by Alex Abramow from Russia: His Sherpas have built up Basecamp, Intermediate Camp and ABC. The team will arrive around April 23 from Kathmandu. Himalaya Vision led by Dendi Sherpa and veteran Kari Kobler hosts this year the teams of Kobler&Partner with the mountain guides Hiroyuki Kuraoka, Nukita Muneo and Andreas Neuschmid and the Alpenglow team of Adrian Ballinger. Their Sherpas reached Intermediate Camp yesterday and are building up ABC today. Climbalaya from Kathmandu has arrived in BC. Transcend Adventures from India: 40 Indians intend to climb Everest this year and have nearly finished their works in BC, Intermediate and ABC. Furtenbach Adventures from Austria led by mountain-guide Rupert Hauer has arrived in BC. I was anxious to see the route, but I felt confident to me after the news that the route was the safest of all time and Phunuru (at IMG) told me that the route was really good as its team of Sherpas. Inhale, exhale, one step, two steps, jumar, repeat. And try not to look at the seracs hanging over your head. I fought in the first 90 minutes to have a rhythm and relax. From nowhere, we were struck by what is probably the most spectacular sunrise I’ve seen in my life. Suddenly, everything seemed easier. In fact, it was. Compared to 2017, the route this year is really more direct and “safe”. There are still some places where we are exposed to the dangers of ice climbing but overall “icefall doctors”, the Sherpas who fix the rope EBC to Camp 2, have done a phenomenal job this year to find best possible way. I met some familiar faces Sherpa on the way, which is always nice. Our first trip was uneventful, except perhaps the very disturbing traffic by inexperienced climbers who really struggled to make their way in the icefall. I always wonder what people think when they climb on Everest with no or very little experience endangering their lives and that of the surrounding mountain climbers but it is a sad fact of Everest. Every year there are inexperienced climbers. Some with luck will go, most give up and others will remain forever on Everest. Anyway, aside from that traffic, it was great and we even returned to our camp just in time for the usual breakfast with the rest of the team that is not mounted. I can understand his feelings. This is a narrative I wrote about entering the Icefall for the first time. You set your alarm for 3:30 am knowing it was unnecessary. Over dinner the first climb into the Icefall was announced for today. Immediately, your anxiety level ratcheted up a notch. The Khumbu Icefall. You have seen so many pictures, a few videos and recently studied it from Kala Patar, Camp 1 on Pumori and your base camp tent, but now it was time for the real thing. Switching on your headlamp, you pull on your real climbing clothes. This is just a trip half way, but it still requires warm layers, gloves, boots, crampons, harness, jumar, cows tail, ice axe – the works. The 3-person tent that seemed so big when you arrived now seems like a closet as you swing your legs off the mattress to pull on your pants. Your arms hit the sides as your top goes on. Scooting to the door, you pull your boots into the tent, cursing at not having the foresight to keep them inside so they wouldn’t freeze. Now you would pay the price with ten minutes of close combat – you against your boots. Finally, dressed for action, you stumble outside your tent only to trip over a line. “Damn, and I’m going to climb Everest?”, you mutter to yourself. Standing in the cold, crisp air, you pause. Looking around you see your teammates performing the same circus act. Glancing at the Icefall, you see headlamps, um, someone is already up there. 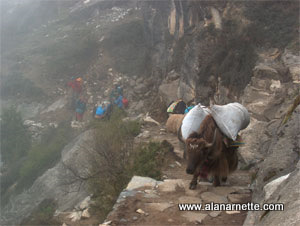 Probably Sherpas carrying a load to Camp 1 or Camp 2. You hear the low hiss of stoves as the cooks are making breakfast. It is cold, but you are not cold. Looking at your yellow 8000 meter boots, the contrast against the white snow is vibrant. Without thinking a smile grows on your face. You are about to enter the Icefall. The Sherpas are gathered by the cook tent eating an unidentifiable concoction of rice, milk, and sugar. They eat with the enthusiasm of a starving teenager. You walk over and enter the dining tent seeing the cooks have already brought out toast and a boiled egg for each climber. You spread some jam on your toast and stare at the egg. A teammates pushes some coffee your way. A grunt is all you can muster. Without warning the Sherpas enter the tent calling out names. Not sure if you are being recognized or punished you stand up quickly and follow your personal Sherpa, Dawa. He sets a brisk pace through the maze of paths in base camp. Switching on your headlamp, you follow closely, still unsure of the correct turns to make. Crampon Point is your destination. With the finesse of a lightweight boxer, Dawa bobs and weaves between the tents. He dodges a yak standing on the trail, careful not to touch the sleeping beast. You soon reach the perimeter of base camp and take a step onto a flattish section of the Icefall. You were here a few days ago to run through your gear on the obstacle course but this time it is for real. The route become circuitous now, up and down small ice hills, stepping over small sections of running water, maneuvering around growing ponds. Careful not to get your boots wet, you take big steps, while Dawa seemingly floats over them. Your breathing increases. Tiny drops of sweat form on your chest, your forehead. The doubts begin again. “Oh my God, if I’m struggling just to get to Crampon Point, what will …” you stop yourself remembering the value of metal toughness. You and Dawa arrive at Crampon Point with the energy of an Indy race car coming into the pit for a tire change. Taking your crampons out of your pack, you now sit on your pack to attach the spikes to your oversize boots. Right, then left; thread the safety strap around your ankle and through the ring; double back the strap. Your done. Dawa looks at your work. Feeling like a child, you look yourself to make sure you put them on the correct foot; buckles go to the outside for safety. You look at Dawa but he has already moved on. The first few steps into the Icefall proper are steep. “Who put the route over a 30 foot ice bump at the start?” you curse to yourself. Your breathing picks back up. Dawa’s headlamp seems like a search light, not looking ahead but side to side using the eyes in the back of his head to see if you are keeping up. He slows down a bit. Reaching the beginning of the fixed line, you take the carabiner attached to a piece of webbing that is attached to your harness and clip in. This act will be repeated several hundred if not thousands of time over the next few weeks. Seeing more people ahead, you silently send a thanks out, hoping they will slow down your Super Sherpa. Moving steadily you gain altitude in the Icefall. The wee hours of the morning are cold, it is dark; there is no moon tonight. Maybe for summit night? The Sherpas often say a full moon is an auspicious sign. Headlamps show the way but so do the line of climbers ahead of you, and the thin white nylon line; another part of climbing Everest you will get to know. Soon the conga line comes to a halt. Actually it is just you and Dawa because, Dawa has no patience for slow climbers and he passed each of them pulling you along in his slipstream. While you struggle to breath, you know this is good sign as he will get you to the summit and not let anyone, or anything slow you down. Looking ahead, the emerging sunlight shows the reason for the sudden stop – a ladder. A ladder? A ladder! Suddenly your mind becomes focused, no more idle thoughts, no more complaining, no more breathing. You are staring a single ladder stretched across a crevasse. In the dawn light, you cannot see how deep it is. Just as well. You lean over and grab the safety line, left one first. Clipping in you feel secure. then the right; now more secure. Moving your right boot off the snow your front crampon points touch the first metal rung. A metallic clink provides the feedback. Your left foot follows but goes to the second rung. You are on the ladder. Now it is time to move. The death grip on the safety line hurts even through your thick gloves. Your right foot inches forward, not too high off the ladder. You make a sudden decision to take it one rung at at time, not two or three like Dawa. Your front points make a successful landing. You feel good, proud of your baby step but then everything changes. Feeling panic, you sense something is wrong. You stop with your right foot ahead and your left behind. You look ahead at Dawa, then it occurs to you – breath. Will you be posting about CTSS as the season progresses? Where I could find a map above the Everest so it would be better to perceive where are the base camps and climbing routes of each sides? When you write measures can you write meters also not just feets because I’m from Europe and it’s easier understand when it’s metric system. I’m sure he’ll have a few people with him at base camp, but does he intend to summit Annapurna I, one of the most dangerous 800ers, alone? Seems insane to me. Alan, I enjoyed the link about Kenton Cool and his UK group. Among those hoping to set records, as you likely know, are two Danish men summiting without oxygen — Rasmus Kragh, who almost made it last year, and Jakob Urth. Ideally, they’d summit at exactly the same time and score a joint record for Denmark! Thanks again for your always interesting posts that help us move vicariously through the Everest season/s!